I absolutely love this! Congratulation on the PH blue! It was well deserved. Nice to have the (motion) blurred parts sharp while other sharp parts (cat, mostly face) are blurred, all in the same image. I was wondering how you made it. Did you jump in parallel to the kitten? Congrats on the Blue! Love the textured movement. CONGRATULATIONS!!! I love the flow and energy here. Thrilling shot. Posthumous Blue Ribbon. Cool processing and creative scene. 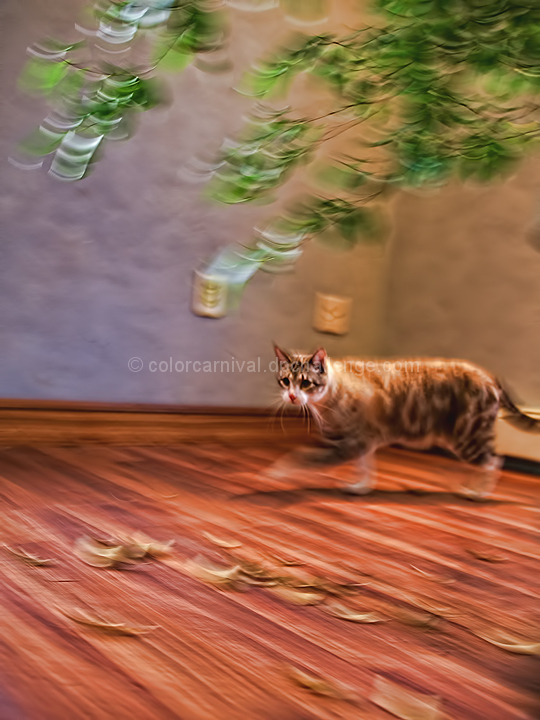 I love cats - and like the motion blur, but can hardly tell the cat is jumping. The processing on this is really neat. Love the motion blur here. I love this, especially whatever you did with the saturation to get that over-the-top edited look. Quite surreal and out of the box. I barely have any idea what I'm looking at. Are they leaves? Anyway, I love it. 10 from me. The cat appears to be strolling, lovely shot but for me it DNMC. Proudly hosted by Sargasso Networks. Current Server Time: 04/22/2019 06:34:18 PM EDT.